Usually sometime early in the year I look back on my reading for the previous year, and share the books on Ghana and Africa I read. Insaidoo, Kwame Afadzi – Ghana – An incomplete independence or a dysfunctional democracy? My African fiction category is a mixed bag, including some novels with locations in African settings, which I realize some people might not consider “real” African fiction. I do admit that, apart from book clubs/groups, I don’t really plan my reading. I do have a lot of TBR books which fill one medium bookcase, and always feel I should concentrate a bit more on these books, but somehow it doesn’t always work out! I know I haven’t done much posting over the last year, and I guess one of my New Year’s resolutions for this year is to do more in this area. Focus is the key though. although I do have to admit to reading some Ghanaian flash fiction, but those I didn’t record! I guess the above will sort of qualify for the 2015 Africa Reading Challenge. Although sometimes I feel it is not much of a challenge really, as I tend to read a fair number of books by Ghanaians/about Ghana and also by Africans/about Africa anyway – approximately 30% of my reading. Just saw an announcement about the Africa39 list of upcoming African writers under 40. 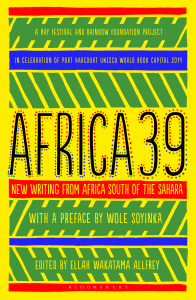 More information is available via the Hay Festival Africa39 webpages . It is however worth noting that all these Ghanaian authors live mostly outside Ghana – though Nii Ayikwei Parkes is presently in Ghana. Congratulations to all the nominees, and of course I look forward to reading the anthology of short stories which will be launched in October 2014. I read quite a lot of different types of books, though I readily admit to a weakness for mysteries/crime/thrillers. But I do also live in Ghana, and have always felt the desire to read books written by Ghanaians – both living here and in the diaspora – and also books about Ghana. To a lesser extent that has also applied to books by Africans and about Africa. I hope these lists give a flavour of some of the range of books I’ve read. Next week there are three bookish events taking place in Accra, and even two of them take place on the same day! The first is actually being advertised as a “public unveiling” – which is slightly strange term, at least when applied to a book. I guess I would associate that more in connection with a tombstone, but then language does change. This is for Nana Kobina Nketsia V’s African culture in governance and development. The second is the launch of another book by Ivor Agyeman-Duah, which I look forward to, since I’ve known him, and tracked his progress for many years. His book is titled Africa: A miner’s canary into the 21st century. Interestingly the first two are both taking place at the British Council here in Accra. Given that both these authors are rather well connected, I suspect the venue will be full. And finally Malaka Grant, a blogger I follow – she blogs at Mind of Malaka – is reading from her recently published book, Daughters of Swallows. I think this should be fun. Selfishly I hope that there will be copies of the books available for purchase, and at a reasonable price! Yari Yari Ntoaso: an international conference of African women’s literature coming up! As readers/followers of this blog will know, I am always on the lookout for interesting literary/library/information events taking place here in Accra. And May definitely looks like a month to look forward to. Recently I received a press release about the forthcoming Yari Yari Ntoaso African women’s literature conference. The Organization of Women Writers of Africa (OWWA) and New York University (NYU), in collaboration with Ghana-based Mbaasem Foundation and the Spanish Fundación Mujeres por África (Women for Africa Foundation), will present Yari Yari Ntoaso: Continuing the Dialogue – An International Conference on Literature by Women of African Ancestry. This major conference will put writers, critics and readers from across Africa, the USA, Europe, and the Caribbean in dialogue with each other in Accra, Ghana, from May 16-19, 2013. More than a dozen emerging and established Ghanaian writers and scholars, including Ama Ata Aidoo, Amma Darko, Ruby Goka, Mamle Kabu, Esi Sutherland-Addy and Margaret Busby will speak about their work on topics ranging from identity, to the craft of writing, to literary activism. These authors will be joined by other international writers such as: Angela Davis (USA), Tess Onwueme (Nigeria), Natalia Molebatsi (South Africa), Yolanda Arroyo Pizarro (Puerto Rico), Sapphire (USA), Veronique Tadjo (Côte d’Ivoire), Evelyne Trouillot (Haiti), and many others (a list of participants is below). Local organizations participating in this exciting gathering include the Pan-African Writers Association, the Ghana Association of Writers, and the Writers Project of Ghana. Ever since I heard of this event, I have been looking forward to it, and am already planning which sessions I will attend!